A highly accurate positive displacement flowmeter capable of supporting a wide range of applications for water, petroleum, solvent, etc. 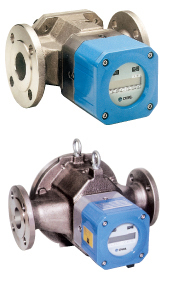 Instantaneous and total flowrates can be indicated in the field and output signal is also available. Battery-powered model is also available (battery replaceable). Standard High temp. Low temp. Water, gasoline, light oil, heavy oil, etc.